Our product range includes a wide range of hydraulic operated fly ash brick making machine, fully automatic fly ash brick making machine, high quality fly ash brick making machine, automatic fly ash brick making machine and fly ash brick making machine. Our skilled professionals hold expertise in offering a quality tested array of Hydraulic Operated Fly Ash Brick Making Machine. Owing to our expertise in this field, our firm is engaged in supplying an extensive array of High Quality Fly Ash Brick Making Machine. In sync with the market development and Client's desire, we are offering Automatic Fly Ash Brick Making Machine. 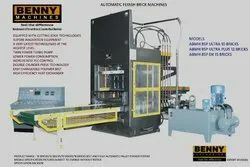 Backed by a diligent team of skilled professionals, we have been able to establish ourselves as the renowned name in the domain of providing Fly Ash Brick Making Machine. 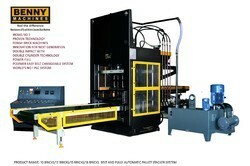 Calculated Production per hour 2160 and for 8 hours 17280, in 80% efficiency production 13,800*,working pressure 80tons. Conveyor belt brick ejection system. Hydraulic power house 250 liters of oil capacity. 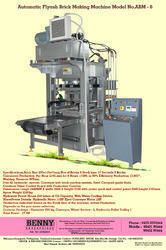 Economic Package: Pan mixer 250kg, conveyor, wheel barrow-2, hydraulic pallet track-1.